A millennium has passed. A sprawling palace in the old royal city of Cancuen now lies in ruins. But, it still talks of the chilling massacre. 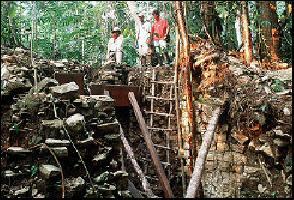 Deep in Guatemala’s Peten rain forest the ruins of the palace have revealed skeletons and the last-minute panic that overtook Cancuen before it was overcome by marauders. The king and queen’s skeletons, 32 Maya nobles’ remains and over a dozen other skeletons were discovered in a sacred cistern at the site and north of the palace by a team of Guatemalan and US archaeologists led by Demarest. The grisly massacre records a critical moment at the beginning of the mysterious collapse of the “great ancient civilization”, the team said. “The king and queen and their nobles apparently were gathered together and slain en masse, many by lance thrusts to the neck or head,” said Arthur Demarest, one of the lead archaeologists of the team that excavated the grim site in Guatemala and its long hidden story.